Sketch Club is underway at Williams Elementary School! 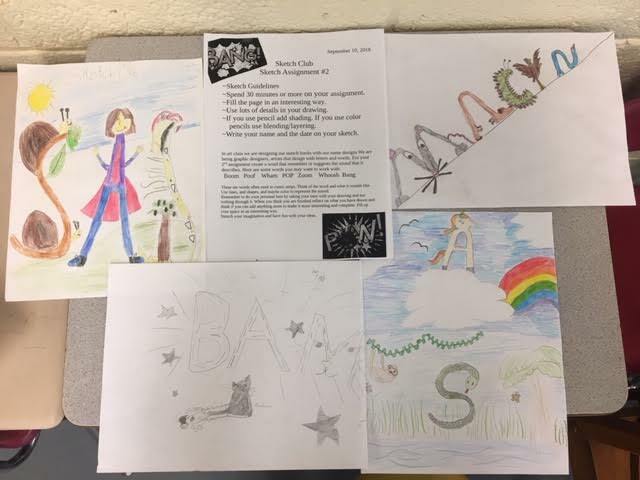 Fourth and fifth-grade Sketch Club is an in-school program at Williams Elementary School for students who love to draw. To get into sketch club students must complete a drawing assignment each week for three weeks. If they complete all three sketch assignments they are enrolled. To celebrate our sketchers, a lunch bunch is held in the “Art Cafe” with a special treat. To remain in sketch club, students need to complete two sketches each month: one is assigned by Ellen Gronlie (art teacher) and the other sketch students have the freedom to sketch a free choice piece. Once a month the students in sketch club and Mrs. Gronlie meet for lunch in the Art Cafe. While having lunch in the Art Cafe, students have an opportunity to share their sketches with other members. At the end of the year, Mrs. Gronlie celebrates her sketch club members with a slide show of their favorite sketches and an ice cream party. Students also receive new drawing materials for participating in Sketch Club.